The English Bulldog leather gymnastic grips are premium dowel grips manufactured from specially selected, high quality split grain leather. All grips have a flexible rubber dowel rolled in soft leather. The dowel is then glued and stitched to the body of the grip. Closure is available in both hook and loop fasteners and double buckle. The high quality hook and loop fasteners have a long life cycle for lots of holding power and the unique reverse double roller buckle closure provides for a tight fit like no other grip on the market. *** This chart is for English Bulldog brand. Please talk with your sales representative about any sizing questions. 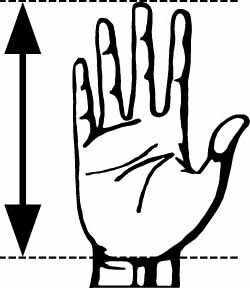 Measure from the BASE of the palm (where palm and wrist meet) to the TIP of the middle finger. Measure from the base of the palm (where palm and wrist meet) to the base of the middle finger. These measurements are an approximate guide and do not guarantee a safe or perfect fit. The gymnast and his/her coach must decide on the appropriate size by evaluating the actual grip once it is on the gymnast's hand. There are dimensions to the hand that cannot be taken into account with a flat measurement such as the position on the wrist where the gymnast might decide to wear the wristband. Only the gymnast and his/her coach can make the proper judgment as to the correct size for any gymnast. UAI will not be held liable for failure due to the use of an incorrectly sized grip. The coach and the gymnast must take final responsibility as to the fitness of a particular size. Improper fitting grips that have not been used may be exchanged for proper size. Please return in the original packaging material, and include return postage of $9.00.